… General Giulio Douhet’s dictum “… the bomber will always get through!” published in his 1921 book “The Command of the Air” seemed to be confirmed when, from 1935 onwards, multi-engined bombers began to appear with cruising speeds far exceeding the top speeds of then existing fighters. Blinded by Douhet’s theories, KNIL top brass decided to create a large bomber force to defend the islands against an enemy invasion fleet. This decision had very far reaching logistical consequences in terms of aircraft, equipment, personnel and organization. It also had the side effect of ignoring the possible role of fighters and dive bombers, considered of little value due their limited range and small bombload. 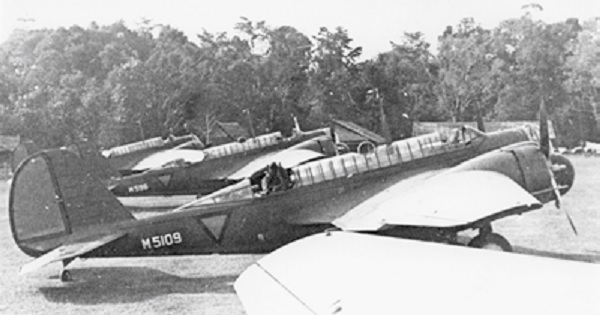 Thus, in mid-1936, the Dutch East Indies Army placed an initial order for 13 Glenn Martin bombers under the export designation 139-WH1 (Wright Holland version 1). What happened next was a political soap-opera. The Colonial Ministry protested, being in favor of Fokker’s proposed T-V bomber (which was still on the drawing boards). This politically correct ‘buy local’ demand quickly disappeared when the military made it very clear they would have none of Fokker’s outdated wood-and fabric construction in a humid tropical climate. The Colonial Ministry, not hampered by any knowledge of aircraft production, then demanded the Martin bombers to be built under license in the Netherlands. As usual, this politically motivated demand was equally unrealistic: nowhere in the Netherlands was a suitable, all-metal aircraft production capability available. In the end the politicians grudgingly had to accept the obvious solution: the bombers would be built in Baltimore and shipped out to the Dutch East Indies. On September 2, 1936, the Dutch East Indies Army (KNIL) officially took delivery in Baltimore of their first 139 WH1 with serial M-501. It arrived at Andir (Bandung) mid- December 1936, together with its sister ship M-502. 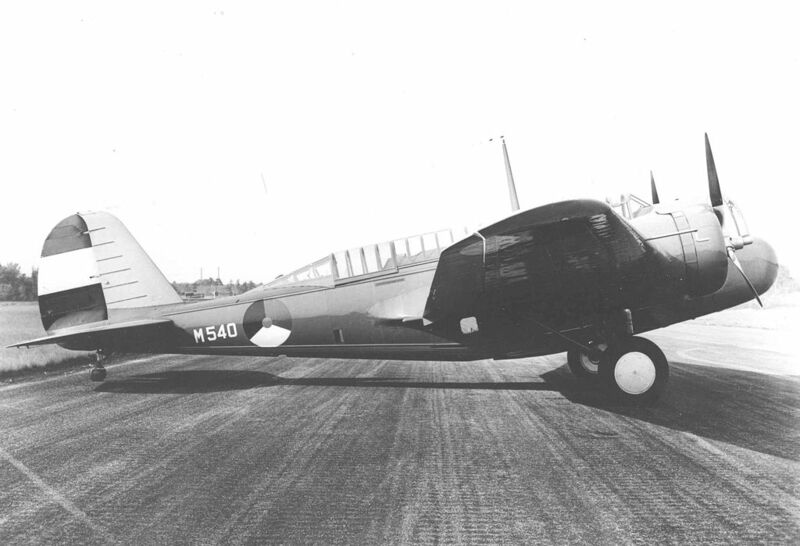 The KNIL ML technical service assembled both airplanes within a week and Glenn Martin test pilot Bill Rowland took M-502 up for its first test flight on January 17, 1937. Deliveries of the first order were still in progress when the Dutch government placed a second order in March 1937 for 26 additional aircraft of an improved version, designated model 139 WH2. This version had more powerful engines (thus a higher top speed), extended range and an increased bomb load. The first of the WH2’s (serial M514) was accepted by the Dutch purchasing commission in Baltimore in December 1937 and by October 1938 all ordered WH2’s had been delivered. Triggered by these sales, the Glenn Martin Company significantly improved the design and gave it a different export designation (model 166). The most striking difference was a single long ‘glass house’ canopy. Apart from redesigned wings and an altered nose, the 166 had better and more powerful engines (900 hp. Wright Cyclone R-1820-G5) fitted with Curtiss constant speed propellers. 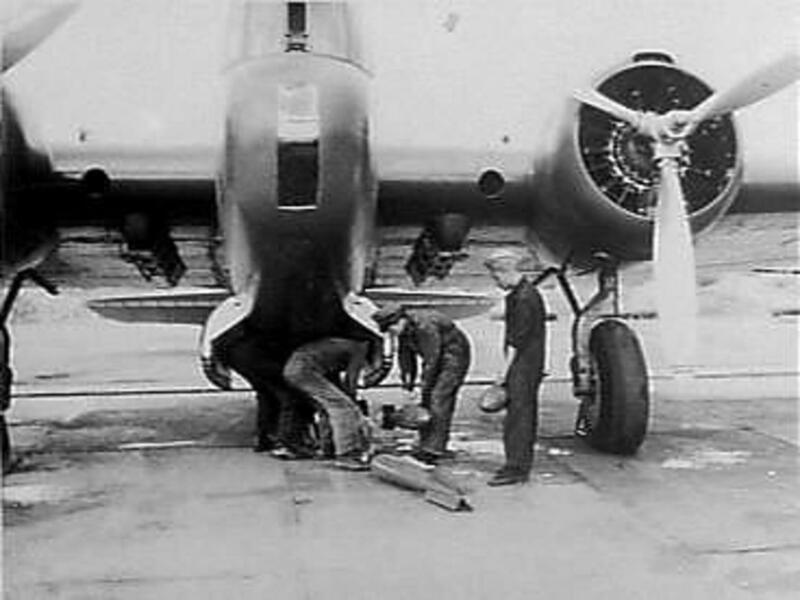 But the most important new feature consisted of bomb shackles under the wings, between the fuselage and the engines. Thanks to these, the bomb load could be hiked from 1200 kg to 2000 kg during short range operations. When the last of this batch was delivered in May 1940, the Dutch Government had procured 120 Glenn Martin 139’s of various types, or almost exactly two thirds of all export models sold. The KNIL ML (‘Militaire Luchtvaartafdeling’ or Military Air Service) had no experience with bombers. Up to the end of 1936 their equipment had consisted of a single squadron of antiquated Curtiss P-6 “Doolittle Hawks” and two squadrons of obsolete Fokker C-V biplanes for reconnaissance work, with some (much delayed) Fokker C-X biplanes on order as replacements. The ground organization was in direct proportion to this minimal force. This picture radically changed from 1937 onwards. An operational force of at least 6o bombers was envisaged. Each Glenn Martin needed a flight crew of three, plus the necessary technical ground crew . To find and train sufficient crew members caused a lot of headaches and remained a sore point until the war broke out. Suitable airfields soon became another headache. Due to budget restrictions during the 1930’s the ML’s training field Kalidjati (near Lembang) had been closed and all ML activities had been concentrated at Andir airfield near Bandung. With the advent of the Glenn Martins, Andir airfield soon became overcrowded. Over and above the civilian operations, there was a constant stream of new bombers that had to be assembled and test flown. A Glenn Martin flying School had been established, busily training bomber aircrew and when the first Glenn Martin squadrons went operational, the situation soon became untenable. The first squadron to reach operational status was 2-VA (2nd air squadron,) based at Andir. Early April 1937 they turned in their antiquated Fokker C-V biplanes and quickly got the hang of the Glenn Martins. Between 20 and 23 April 1937, 6 bombers of this unit made the first long-range flight to Borneo. Gradually, as more and more Glenn Martins became available, the number of operational squadrons mounted and a new organizational model became necessary. In 1938 the ML was reorganized in “Vliegtuiggroepen” (Air Groups or Divisions) which in turn consisted of a number of “Afdelingen” (Squadrons). Thus, 1-VLG-I was the first squadron of Air Group One. Each squadron was then split into 4-aircraft flights as the tactics of the day required. Losses through accidents were high; 7 bombers had been lost by the end of 1939 (2 WH-1, 2 WH-2 and 3 WH-3). Two of these accidents occurred on night flights under black- out conditions, most others were caused by undisciplined or complacent flying. During the pre-war years, the Dutch government tried to keep up a ‘Neutral’ appearance and did not discuss mutual defence plans (until much too late) with the British and Australians. However, on a lower level there were frequent contacts and visits. In May 1941, for instance, a flight of Glenn-Martins visited Darwin, in Northern Territory, Australia, and RAAF Lockheed Hudson’s reciprocated by visiting Ambon and Timor. 1-Vlg III visited Jolo in the Philippines and, in September 1941, its afdeling commanders toured Malayan airbases and received short courses in RAF operational procedures. After the attack on Pearl Harbor, the (unofficial) mutual defense agreements with Great Britain, Australia and the USA were activated. 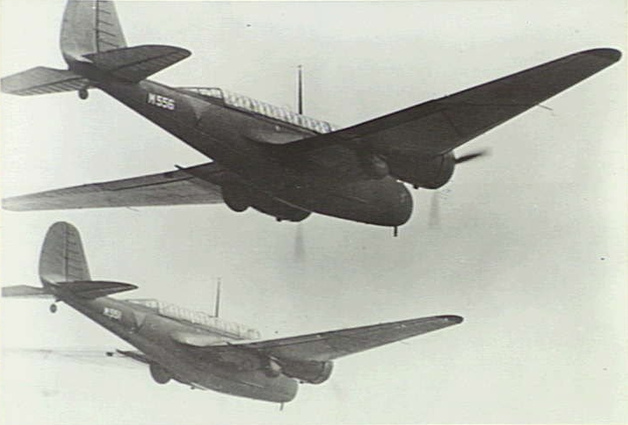 While Australian forces wre sent to help defend the eastern part of the archipelago, squadrons of Glenn-Martins were either sent to reinforce the RAF forces or were tasked with the defense of various important targets on British territory. I have chosen to give a brief account of Glenn Martin operations in some significant operational areas, rather than a day by day accounting of the campaign. On December 8, 1941 the Japanese 25th Army commanded by Lieutenant-General Tomoyuki Yamashita launched an amphibious assault on the Malay Peninsula. Under the mutual defense assistance agreements with Great-Britain, 2-VLG-I from Singkawang and a flight of Brewster Buffalo fighters were put under operational control of the British Far Eastern Command (FEC). On the same day 22 Glenn-Martins of VLG-III ordered to Singapore’s Sembawang airfield. This move showed that co-ordination in the area was still a problem; British anti-aircraft guns briefly opened fire at the approaching Dutchmen…. As none of the crews had been trained in night-flying, nine of the Glenn-Martins were sent back to Java the same day, crews to be trained forthwith. On their return the second squadron could be sent back for training. During the following weeks the Dutch bombers carried out daylight attacks on Japanese forces in Malaya, usually bombing from high altitude. Later in December the Glenn-Martins were frequently dispatched on convoy protection missions. On December 24 and 28 VLG-III flew missions against the Japanese forces at Kuching.(Borneo). The advancing Japanese had, in their relentless drive to the south, captured many Malayan airfields nearly or completely intact. This enabled them to send an increasing number of bombers and fighters against the Allied forces. Two Glenn-Martins were shot down near Penang on January 1, 1942. Recently flown in Hurricanes went into action on January 18 with some success but they were too few to stem the tide. On January 19, 1942, four Glenn-Martins were lost, attacking Japanese troops on the Muar River threatening to cut-off the Australians at Gemas. 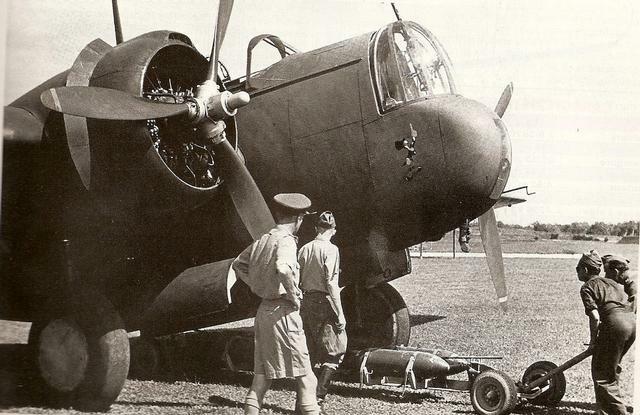 From mid-January onwards, the Japanese started bombing Singapore twice and sometimes three times a day with 27 to 54 bombers at a time, causing great destruction to the airfields and destroying many aircraft on the ground. This was one of the reasons why, on January 22, 1942, the remaining Dutch bombers and fighters were recalled to Java. The situation deteriorated rapidly; by February 10, the RAF decided to evacuate Singapore and chose Palembang P1 as its base of operations. On February 15, 1942, the fortress of Singapore surrendered to the Japanese. Borneo was one of the Japanese top priority targets because of its oil production. The Borneo refineries supplied Japan with up to 35 percent of her petroleum products and more than half of that used by Japanese forces in the Philippines. Oil production centres existed around the island, with the Balikpapan refining and oil centre second only to Sumatra’s Palembang in production. The ML-KNIL Glenn-Martin presence consisted of 2-VGLI at Singkawang-II and 1-VLG-I at Samarinda-II. The only fighters available were a squadron of Dutch Brewster Bufaloes. Dutch navy Do-24’s sank a destroyer and damaged a troopship 9 miles north of Miri on the night of the 17-18th. On December 17, 18 and 19, Glenn-Martins from Singkawang-II made daylight attacks in very bad weather on Japanese shipping near Miri but without results and at least three Glenn-Martins were shot down. These raids, unfortunately, led to the Japanese discovery of Singkawang-II on December 22. On December 23, twenty-four Japanese aircraft bombed Singkawang II airfield, severely damaging the runways. Ordered to attack the Japanese convoy one Glenn-Martin crashed on take-off, the rest of the squadron was unable to take off with a bomb load. This damage forced 2-VLG-I to move to Palembang P-2 (Sumatra), 350 miles away. December 24, Japanese bombs destroyed a Glenn-Martin on the ground. Singkawang-II was occupied by the Japanese on December 27. After securing the Miri oilfields, on December 22, the Japanese convoy moved westwards to Kuching and landed its troops at Kuching on the morning of December 24. 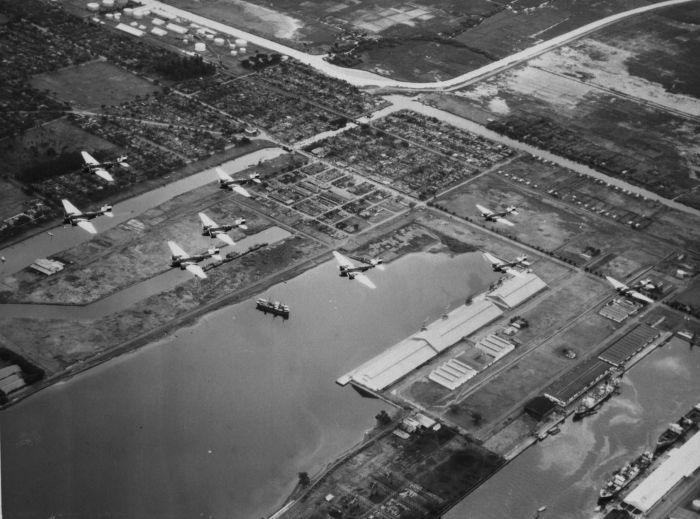 The town was captured in the afternoon and next day, December 25, Kuching airfield as well. Bombers from Samarinda-II sank two Japanese support ships off Kuching on December 26 with the loss pf one Glenn-Martin. Dutch Borneo –Tarakan, Balikpapan Knowing the Japanese were underway the Dutch destroyed nearly oil wells at the island some time earlier. The convoy was spotted on December 10 by a Dutch Navy Do-24. The Japanese landed on the 11th and a fierce fight developed. The small Dutch garrison was soon overwhelmed, only a pair of coastal artillery pieces kept on firing until the next day. Glenn-Martins from Samarinda-II attacked Japanese shipping on December 12, causing damage but losing one bomber plus crew. 2-VLG-I was ordered back the next day, not knowing the Japanese had ordered the Tainan Kokutai, operating from Jolo Island and flying the formidable Mitsubishi Zero fighter, to fly permanent patrols to protect the invasion fleet. The first flight of three Glenn-Martins ran straight into one of these patrols and they were all shot down. A second flight managed to broadcast a warning before two of them were also shot down. Of the two other flights on their way to Tarakan, one received the message and turned back to base. The other flight bombed Tarakan airfield (killing 15 Japanese soldiers and wounding 27) and came back unharmed. The Dutch troops capitulated on December 12 but on the following day the Japanese killed 219 POW’s, infuriated by the attacks on their ships and the airfield as well as the prolonged resistance by the coastal gun crews. Balikpapan The Dutch began destroying oil facilities at Balikpapan on January 18 1942, knowing Balikpapan would be the ‘next stop’ of the invading Japanese. The invasion fleet appeared off Balipapan on January 23 and was attacked by nine Glenn-Martins from Samarinda-II, escorted by twenty Brewster Buffaloes. They sank one transport ship and damaged a second. During the night of 23-24 January 1942 Maj Gen Sakaguchi’s 56th Mixed Infantry Group and the No. 2 Kure SNLF landed in Balikpapan and occupied the town and oil refineries without resistance. The Japanese forces finally located Samarinda-II on January 24 and it was immediately attacked by Mitsubishi Zero fighters. Two Glenn-Martins were shot down in flames while landing; two others were destroyed on the ground. The remaining aircraft were withdrawn to Java. Sumatra The critical points in the defence of Sumatra were two airfields near Palembang, known as P.1 and P.2. P1, sited at a civilian airfield, north of the refinery town of Palembang, was to become the base for Allied fighters on Sumatra. Most Sumatra-based bombers flew from P.2, located south of Palembang. The fields were mainly used by the RAF. On December 23, 1941, 2-VLG-I was forced to move to P2 after their secret base, Singkawang-II had been discovered by the Japanese. From there the Glenn-Martins participated in raids against the Japanese in Malaya. Japanese Paratroopers landed on P1 on February 14 and heavy fighting developed. The next day Japanese invasion troops were coming up the Musi River in barges and more paratroopers were dropped near Palembang. The Dutch command ordered all remaining Dutch bombers to be withdrawn to Java on February 16. The Japanese forces envisaged a campaign in which they would gradually encircle Java. For that reason they landed on the Malay Peninsula on the first day of the war, and, eight days later, on December 16, invaded the northern part of Borneo. On December 20, they landed at the important port of Davao on the southern coast of Mindanao, the major southern Philippine island. Five days later, they captured and occupied Jolo, a small island between Mindanao and Borneo. The possession of Davao and Jolo gave the Japanese bases for air and naval advances against the NEI to the south. On January 11, the Japanese Empire belatedly declared a formal state of war with The Netherlands. That day, its forces landed on the northeast corner of Celebes, an island consisting of four peninsulas and three bays. About two weeks later, on the 24th, they landed at the important port of Makassar on the southeast peninsula, completing their conquest of the Celebes. Ceram, Timor, Bali and Borneo fell in rapid succession. It took them longer to subdue the defences of Malaya and Sumatra because of Dutch and Allied airpower stationed in or moved to those areas.down during this flight. After their recall from Borneo and Sumatra, the surviving Glenn-Martins were relegated to reconnaissance duties By the end of January 1942, Java was almost completely surrounded by Japanese forces. The captured airfields enabled the Japanese to systematically raid all Java airfields. They shot down two Glenn-Martins near Tjililitan on February 9, on February 20, five were destroyed on the ground during another raid on Tjililitan and two more were destroyed on the ground during a raid at Andir on February 24. The Allied Forces in Java surrendered to the Japanese on March 8, 1942. All that remained from the bomber forces was a handful of older model WH-1’s and some WH3’s in various states of disrepair. At least nine WH1’s were captured more or less intact by the Japanese as well as one WH3. Some of them survived the war, to serve briefly with the Thai air force in the late 1940’s.